The Cistercian Abbey of Fontenay is an early Cistercian monastery based on the ideal of self-sufficiency. 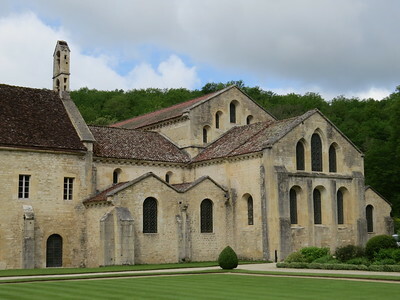 The Abbey of Fontenay was founded by Saint Bernard of Clairvaux in 1118. Located in a small forested valley 60 kilometres northwest of Dijon, it achieved great prosperity in the 12th and 13th centuries. Fontenay enjoyed the protection of the Kings of France but was plundered in the Hundred Year's War and the Wars of Religion. Later, its fortunes declined, and the refectory was demolished by the monks in 1745. The abbey was closed in the French Revolution. The church of the abbey was built from 1139 to 1147 in the prevalent Romanesque style, and marked by the austerity typical of Cistercian architecture. It has a cruciform plan. Apart from the demolished refectory, the abbey retains almost all of its original buildings: church, dormitory, cloister, chapter house, caldarium or "warming room", dovecote and forge, all built in Romanesque style, with later abbot's lodgings and infirmary. 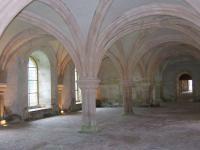 The Cistercian Abbey of Fontenay is a 12th century former monastery in Burgundy. The Cistercian godfather Saint Bernard of Clairvaux found a sufficient remote location to create a new community of monks, one of many at that time. The Cistercians broke away from the mainstream Benedictines because they felt that the Benedictine monks had become too worldly and devoted too little time to manual labor. The Cistercians made up for that in self-sufficient communities like this. The Abbey owes its place on the List to its excellent state of preservation. I visited it by car from Reims on a combined day trip with the WHS of Vézelay. In the year 2015 this still is an off-the-beaten track location, though the Abbey receives over 100,000 visitors a year. I drove on minor roads for over an hour, passing this region’s typical ramshackle villages that look deserted. Only at the site’s car park I was back among living creatures again. I arrived around 10.30, at the same time as two buses with German tourists. Also I counted some 40 cars with individual visitors. Access to the site is run professionally. As the Abbey is now in private hands, they rely on the income from tourists to cover the costs of conservation. There’s a 10 EUR entrance fee if you go in by yourself, or 12.5 EUR if you join a guided tour. They hand out brochures in several languages, I received one in Dutch which was informative enough to get to know the monastery complex. I was keen to take a tour though. Before that started, I walked around by myself to take photos. The grounds are kept immaculate. There’s a large garden at the back, and water features both there and to the side. The 11 a.m. tour attracted some 35 people. Explanations are given only in French, so when that's not your first language you have to listen in very closely. Honestly I missed about half of the stories that were told. They do come in great detail. The tour covers no other areas than you can visit individually, but it is worth joining for some extra detail. One of the nicest spots is inside the Abbey Church, where a floor covered with enamelled tiles, the old altarpiece and sarcophagi of a Burgundian knight and his wife fight for attention. The interior of the buildings is very austere. The Chapterhouse for example is nothing like the fully painted one of the Dominicans in Florence that I visited a few weeks ago. The absence of paintings and colours was done on purpose, to comply with the order's simplicity and not distract the monks during their contemplative prayer. This might not be one of the most famous French WHS, but it is really worth a detour. I especially liked the variety in buildings, such as the dovecote, the dog kennel, the monks' sleeping quarters, the bakery. The tour ends at the forge, where the monks produced tools. They extracted iron ore from a hill that overlooks the monastery. By diverting the river of Fontenay, water wheels were able to power the hydraulic hammers that would beat the iron. The forge was created around 1220 and became the first metallurgical factory in Europe. The best maintained/upkept site I have seen but perhaps this is because the site is only opened to paying tourists. It´s history regarding iron handling was interesting as it seems to be a pattern for later iron handling. But we must realized it is all restored and not so much original as many other sites. I visited this WHS in July 2013. It is really well kept and quite different from the Maulbronn Abbey in Germany I visited earlier this year. The guide is very informative and explains the site in detail. After the tour I explored the site on my own since all the other tourists headed towards the car park, which meant I had the site all for myself. The cloister and austere chapel are in great condition considering that they are over 1000 years old! Well worth the detour from nearby Vezelay! The restoration of this ensemble of buildings has been so carefully carried out that it is hard to believe that they are nearly 1000 years old. The grounds too are kept in pristine condition. To reach this site I had no alternative but to take a taxi from Montbard station. In between showers of rain I moved from abbey church to cloiser to dormitories to kitchen and workshop, all of which lacked decoration and seemed most austere. In our trip to France we have visited the Cistercian abbey of Fontenay, founded by St. Bernard in 1119 and built in the small valley of the Engrevies. The church was constructed from 1139 to 1147 by the abbot Guillaume, financed by the bishop of Norwich Ebrard, that is buried here, and consecrated by the Pope Eugene III, a Cistercian and former pupil of St. Bernard. The abbey, restored in 1906, is a Romanesque masterpiece and it’s entirely preserved in this style, apart from the refectory and despite the transformations of the 13th, 15th and 18th centuries and the ruins of the 18th and 19th century. It has a plan in the form of latin cross, a blind nave and a towerless transept and contains only an altar and a statue of Our Lady; near that are the cloister and the chapter house. The architecture is simply and modest and places ashlars side by side with crude rough-cut rubble. There are also many communal buildings within the enclosing wall: the monks’ room, the monks’ dormitory, the council room, the heating room, the abbot’s lodging, the refectory, the infirmary, the guest quarters, the bakery, the hostel, the chapel, the garden, the gate, the dovecote and the forge (12th century), that is one of the oldest industrial buildings in France. I liked very much this abbey because of its particular and simply architecture. It's worth to be visited if you are in Burgundy but I don't think it justifies the inscription because it isn't the Cistercian abbey neither most complete, nor best known, nor that with the most perfect architecture. The Abbey lies a few km from the town of Montbard, which has a train station. The easiest access however is by car: it's 80km north of Dijon, 228km south of Reims or 275km east of Paris. You'll need car navigation or a map. Dog statues: Two statues of dogs guard the entrance to the former kennel. The dogs belonging to the Dukes of Burgundy, who hunted in the forest, were kept here. Prison: Isolated right at the very end of the dormitory, the little building, which dates back to the 16th century, is often considered as having formerly been a prison. The abbots could legitimately enforce justice of any kind to those who lived on the land that belonged to the Abbey. But it might also have been the "place where the monks preserved (‘locked up’) the Abbey’s most precious possessions, such as books or objects of devotion."